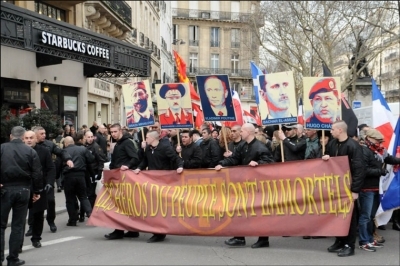 Members of the extreme right-wing organisation ‘La Troisieme Voie’ protest against US imperialism on February 2 2013 in Paris. Nearly two decades ago, several parties and far-right groups started to weave relations with the Syrian regime. For example, communications began between some of the French right in France and the Syrian regime, since the nineties. Many visits then followed. Most notable was that of “Frederic Chatillon“, the president of the extreme student group (Groupe Union Défense), who is very close now to “Marine Le Pen”, the current President of the French party «National Front» (Front National). During his visit in 1994, he met the Syrian Defense Minister at the time “Mustafa Tlas“. In the first decade of this century, especially since 2006, the visits increased. Most of them took place in Lebanon, the usual place to hold meetings between visitors and the Syrian Social Nationalist Party which is an ally of the Syrian regime. Frederic Chatillon with Alain Saural were some of the most prominent visitors. This relation was not limited to the official visits and political discussions, it extended to business. For example, the company (Riwal) which is owned by Chatillon, founded the company (Riwal-Syria) to develop economic relations between Syrian and French companies in 2009. With time, far-right demonstrations supporting the regime were organised in many European cities, from Rome to Warsaw and Geneva. At the same time, several visits to show support were organized, notably the «fact-finding mission» in June 2013. Several European far-right personalities took part in this visit like Nick Griffin “MP in the House of Commons”, Philip Dewinter “deputy in the Flemish parliament in Belgium”. This extent of the support reached the level of going to Syria to fight along side Assad forces in some cases, as the New-Nazi Greek organization «black lilly» (Mavros Krinos) declared. There were also many meetings held by the far-right which aimed to discuss the Syrian situation and how to support Assad’s regime. The most notable was the Boreal Festival which was held in Kanto in Italy on the 12th of September 2013 in the presence of a large number of European fascists. Paradoxically, the Mayor of Kanto, who was hosting that event, begun his speech with words by Rosa Luxemburg! In his book “The anatomy of Fascism”, Paxton says that Fascist movements are always in need of an enemy that symbolises the overwhelming crises that’s taking society by storm, and who pushes the mass to unite under the flag of the saviour leader. Towards the end of the cold war, most far-right movements in northern Europe considered The Soviet Union to be that enemy-symbol, to the extent that Jean Marie le Pen, the leader of the far-right French party, The National Front, alleged that he carried the legacies of Winston Churchill, Douglas McArthur and Ronald Regan1, not just in the political arena, but also in the field of Economy. For until the end of the eighties, the National Front was glorifying and defending liberal Economy. – Cultural and political American dominance represents a threat to national identities. – The American model reflects a presence and mix between various races and cultures, regardless of the racism and inequality that are rooted in this model. This ideological change, even if directed solely at the national internal interest of these parties, carries in its folds the support of this right for the Syrian regime. Theorists such as Soral, consider Bashar Al-Assad to be one of the characters standing in the face of the global system. Moreover, the Syrian regime is the example, even if not ideal, for their slogan, “left wing in terms of work, Right wing in terms of values”. Emphasising that this system is not applicable in Europe rather suitable for “the political idiosyncrasies of the Middle East, where it is important to have a strong leader to control the ethnic sectarian cohesion with a firm hand, and that is usually acceptable by all clans… As was the case in the past [in Europe]”. In addition to the excuse of the “pressing foreign danger”, the far-right parties also need and internal enemy that can be a factor in the demise of the mass, and that prevents the achievement of a more comprehensive and stronger society. [ 7] Among the internal enemies of this Right is the “foreigner”, and in Europe the two main “foreigners” in the eyes of the far-right are the Jews and recently the Muslims. However the anti-Semitism of this Right does not always translate into animosity towards Israel. In the era of the cold war, most of the far-right considered Israel as the fortress of the west in the face of the Soviet Union. However this rapprochement was always hindered by the position of the far-right with regards to the holocaust. With the end of the cold war, and the redefining of the enemy, Israel moved from the impervious fortress in the face of the communist danger to the strongest ally of the new American enemy. This development was accompanied by a change in the perception of some of this right and their rapprochement to some of the European groups, in a step some researchers attribute to the appearance of a new danger for this Right in Europe, namely the Muslims. This clarifies the original seeming paradox. There is no contradiction in the support of the Far-right for the Syrian regime, and their animosity towards the Syrian refugees in their countries even if they were pro-regime. Moreover, animosity towards Islam becomes a secondary reason to back Assad. We mustn’t forget that this Right supports, even boasts about fighting side to side with an Islamic party, Hizbollah, as declared by the organization “Black Lilly”. One can also see clearly the pivotal role of the far-right parties that are Assad’s regime’s allies, in forming and strengthening this relationship and what that entails. This explains the regular visits of this European right to Beirut to meet parties such as the Syrian National Social party. The role of this party in particular and its network with the European Far-right deserves deeper consideration, to achieve a more comprehensive understanding of the topic. Posted on April 24, 2014, in Uncategorized. Bookmark the permalink. 3 Comments. Have you a FRENCH version of the text ?